A required lecture for University of Michigan art students featured a speaker who compared PM Netanyahu to Nazi leader. A required lecture for University of Michigan art students featured a speaker who compared Prime Minister Binyamin Netanyahu to Nazi leader Adolf Hitler, JTA reported on Sunday. Speaker Emory Douglas, part of the “Penny Stamps Speakers Series Presentation” of the Stamps School of Art & Design, displayed a slide that showed a picture of Netanyahu and Hitler with the words “Guilty Of Genocide” written across their faces. Below the photo was the definition of genocide. Douglas “worked as the resident Revolutionary Artist and Minister of Culture for the Black Panther Party in the San Francisco Bay Area from 1967 through the 1980s,” according to the school’s website. “During his tenure, Douglas created powerful images to depict the reality of racial injustice in America and to promote the party’s ideologies. His distinctive style established the “militant-chic” style decades before the aesthetic became popularized and sought to flip the cultural paradigm from one of African American victimhood to one of powerful outrage,” says the website. The content of the lecture first came to public attention via a Facebook post on Friday by a Jewish University of Michigan student, Alexa Smith. The post included a photograph of the slide of Douglas’ artwork. Smith noted that two years ago, another mandatory Stamps lecture speaker, Joe Sacco, called Israel a terrorist state and explicitly claimed that Israeli soldiers were unworthy of being represented as actual human beings in his artwork. “This time I will no longer sit quietly and allow others to dehumanize my people and my community. The administration is repeatedly failing to forcefully respond to antisemitism, and so it comes back worse and worse each time. A line needs to be drawn and it needs to be drawn now,” she concluded. The University’s Assistant Vice President for Public Affairs, Rick Fitzgerald, said in a statement quoted by JTA that “Douglas covered a wide array of subject matter within the overarching context of his work, which looks at the oppression of people across the globe by governmental powers,” and added that his presentation included a video and nearly 200 slides with images of his work. “The Stamps program is intentionally provocative and we are clear with our students about this. The school does not control or censor what speakers present,” he explained. The incident marks the second time in a month that the University of Michigan has come under fire. 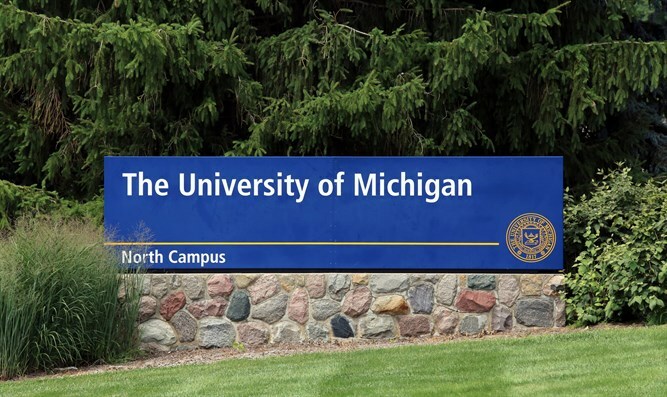 In September, University of Michigan professor John Cheney-Lippold was criticized after he declined to recommend junior Abigail Ingber for a semester abroad in Israel because he supports the Boycott, Divestment and Sanctions (BDS) movement against the country. In response, 58 organizations called on the University of Michigan to sanction professors who implement academic boycotts of Israel. In recent years, dozens of states – including Michigan – have passed legislation against the BDS movement. Among the other states to have approved similar laws: New York, California, New Jersey, Indiana, Florida, Tennessee, Montana, Kansas, Arizona and Virginia. BDS, however, remains a concern in US campuses. A recent study revealed a close connection between the activities of lecturers who support boycotts against Israel in a certain institution and a sharp rise in anti-Semitism in the same institution.